Keep your baby’s sleep area in the same room where you sleep. Room sharing not bed sharing. Always place the baby in a safety-approved crib, bassinet, portable crib for sleep. Each year, approximately 3,500 infants die from sleep-related accidents that cause suffocation, strangulation or undetermined causes. No hospital in the state is doing more to lower that number than Lowell General Hospital. The team on the Mother and Infant Unit (MIU) is the first in the state to be recognized as a Gold Certified Safe Sleep Hospital. The Cribs for Kids® National Safe Sleep Hospital Certification program recognizes hospitals that show a commitment to reducing infant sleep-related deaths and promote best safe sleep practices through infant sleep safety education. 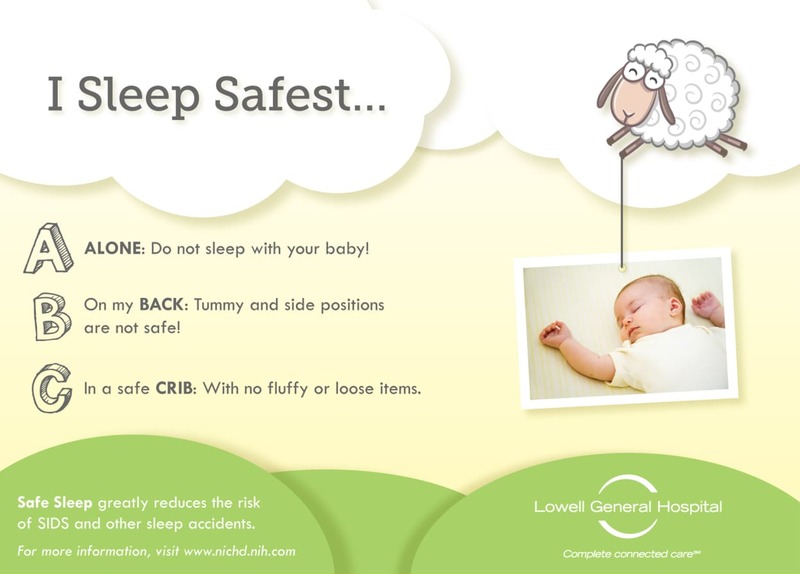 For additional information and education on safe sleep please visit the Cribs for Kids® website.